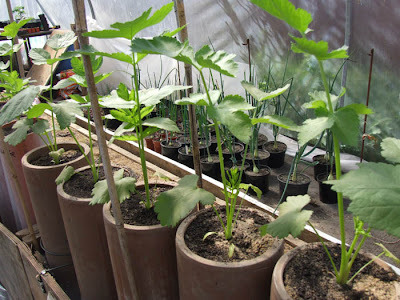 Carrots: Long, stump: Long carrots yet to show after 3 weeks, so all stations have been resown. 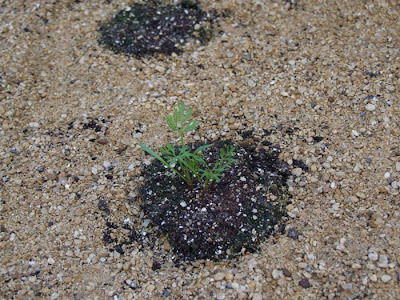 My stump carrots in the tunnel also had a hard time with about one third not germinating and only a few did germinate in the bore holes that were planted with about 7 seeds, resown empty spaces. 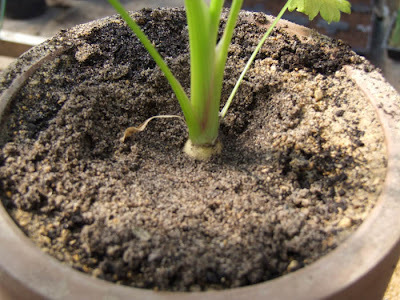 Parsnips: Looking really good and have clean tops with no pest damage and lush foliage. I am using a moisture meter just so i know how moist the soil is about 7 inches down so i can judge how much water to give. 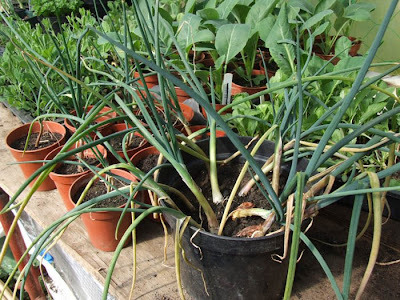 Onions: Most of my large onions are now planted outside in the raised bed and are larger than my thumb with some being double this size but most are an even size which is what you want. 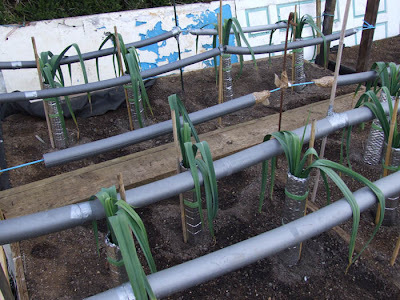 I have kept a few onions back that i hope to plant up inside the tunnel. Planting onions outside can be risky and wont make a size anywhere near the national onions you see at about 20-22 inches around but i wont be doing any nationals. 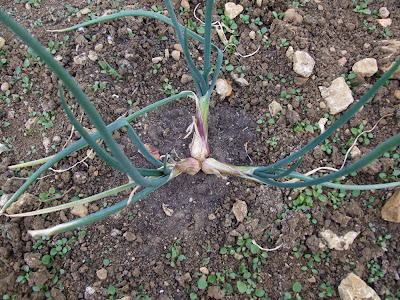 I really want just nice sized onions and hopefully avoid botrytis that always seems to attack onions grown inside more than outside, i also tend to find a lot of onions split inside the tunnel because of the heat levels in summer. Celery: My first sowing of celery that was about 8 inches high and looking really healthy all wilted under the extremely hot day we had. 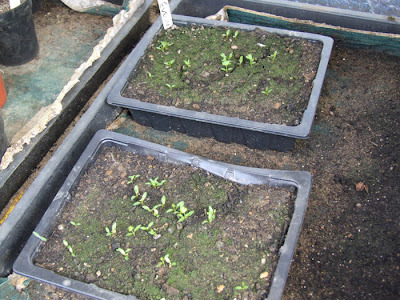 I still have a second and third sowing which have just been potted up and will hopefully make it on time for the shows. Potatoes: I have 15 bags of Kestrel in and i hope to get another 30 or so planted this weekend, and another 30 the next week after. Shallots: Very impressed so far and are probably the biggest i have had for this time of year and have just grown non stop. 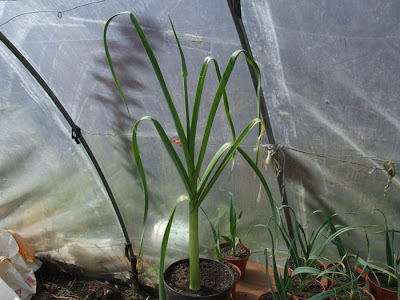 Leeks: The pendle leeks inside the tunnel are looking very good indeed and are on par to make a decent size. The one problem i have this year is this orange colour at the base of the plant from which i lost 5 leeks in the early stages. It looks like some kind of fungus, I have noticed one of my leeks inside the tunnel and one outside have a slight orange colour at the base so i have removed a few flags to clear it and sprayed with a fungicide in the hope it wont come back. 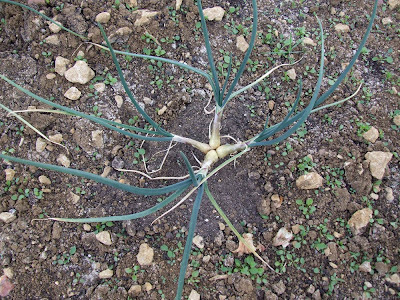 This could be due to excess water surrounding the base of the plant so i am avoiding watering the base of the leek. The welsh seedlings that are planted outside this year because they have a tendency to bubble up and the flags split under stress/ hot days are looking good but slightly behind the pendle leeks now. 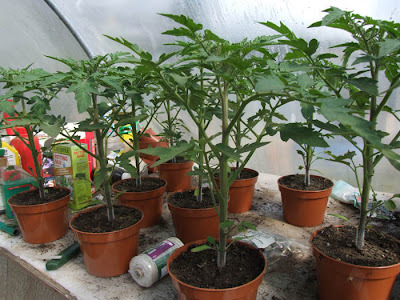 Tomatoes: My 10 cedrico are now in there final pots and look extremely healthy with the first truss of flowers just showing at the tops. 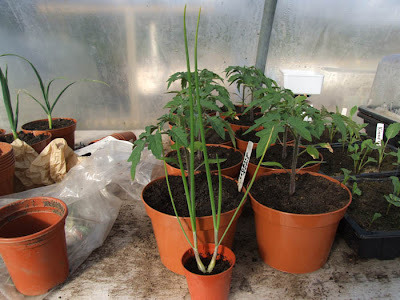 My 5 goldstar tomato cuttings from Medwyns came yesterday and have been potted up into there 5 inch pots. 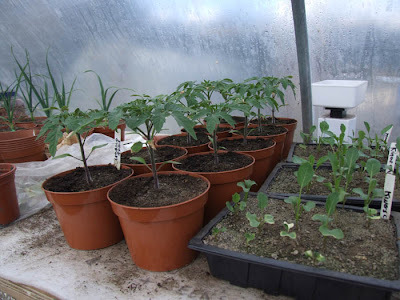 When receiving plants from growers or even from a local greenhouse you must keep them warm for at least the first week at night so they can adjust to the temperatures inside your greenhouse/tunnel, as they have been growing in a warmhouse they will wilt on you very quickly. If you do buy from a garden center i suggest you buy the smallest plants that have had more room to grow than the other leggy dead things in the pot next to it. I have also taken some cuttings from my cedrico already and they have rooted so we will see how they get on later. 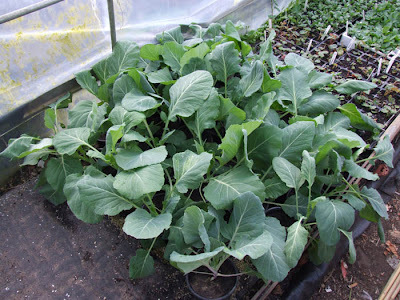 Cabbage: My large cabbage are in 2litre pots at the moment and i hope to get them in soon, i have another 200 or so also to plant out in the allotment. These will all need to be covered and my show cabbage will also have collars put at the base to avoid cabbage root fly. Weeds: These are looking extremely good this year and i should get a good crop of them. French Beans just popped up, planted 4 in a pot and these will be staked with some canes soon. Peter Clarke leek that i reselected from last years leek by cutting off the root and cutting the leek about 6 inches up from the bottom, this is then replanted and then stripped back to the main growing core once rooted. You can see it has just produced the seed head and this will produce some nice bulbils for next season..More on how to do that later. 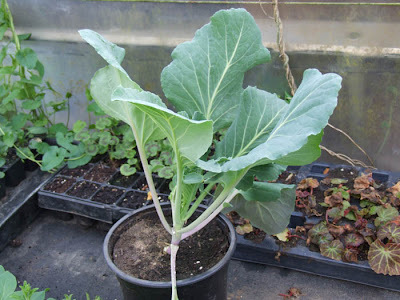 We just haven't had the time to plant anything else out so my large cabbage have been potted off and are ready and waiting for the pigeons to eat them. Really disappointed about the celery as this is really the first of the big disasters this month along with the long carrots not showing up after 3 weeks of being planted and poor germination on the stump variety in the tunnel. I'm afraid we had a bit of a heatwave after a cold night so the propagator lid (turned off mind you) was left on and by mid morning the celery had pretty much been destroyed. This is the problem when you live a distance from your poly tunnels and veg. 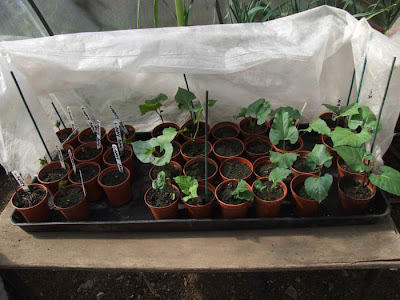 I do have a 2nd and 3rd sowing that i can prick out but they are looking a bit late now, i just hope i can get enough and they grow fast ready for the shows. I have plenty of other celery that didn't die that isn't really good enough for showing, typical. My first potatoes are in "kestrel" which are a coloured variety and are a very popular choice among the show masters. 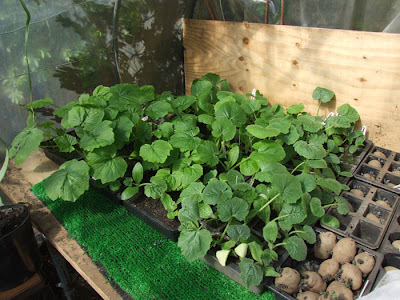 I plant all my show potatoes in 17ltr polypots using "Westlands Irish moss peat" that has been passed through a shredder. Every 300lts i add 3 pounds of calcified seaweed and 3 pounds of Vitax Q4 and sometimes some slug pellets but i forgot on this occasion. 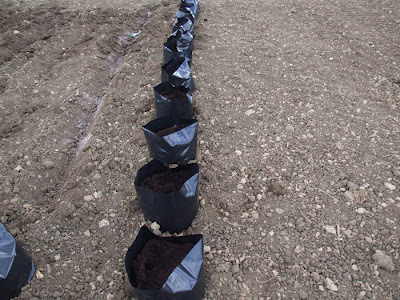 A 100ltr bag of peat is enough to fill 5 bags, quite an expense. The potatoes as you can see in the picture are planted in a trench that i dust in "Fish, Blood and Bone".The roots from the potato that is planted near the bottom of the bag will grow out of the holes into the soil below and the potatoes will stay in the bag, keeping them clean in the peat. +Some others i cant remember but probably wont make it in the bag due to cost. The runner beans are nearly all up and look healthy as long as no frost catches us out they should be mighty fine specimens. The variety's I'm growing for show this year are "Stenner" and a new Unnamed trail variety that medwyns sent me that are suppose to be a good rival to the famous stenner bean. 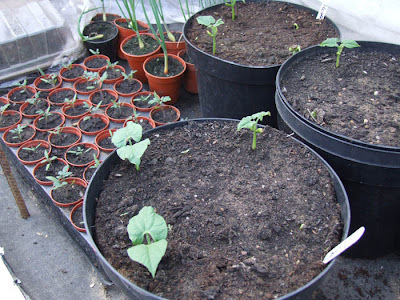 The trick to growing good runner beans is to have a well manured trench site that holds moisture (fill it with cardboard if you like and soak it). The young beans need to straightened from birth and thinned down (normally i thin down to 3,4 or 5 beans on each truss. This will ensure you have long, straight beans with no bulging. The enorma variety is another popular choice but i do tend to find the beans bulge out more and are harder to get the length. 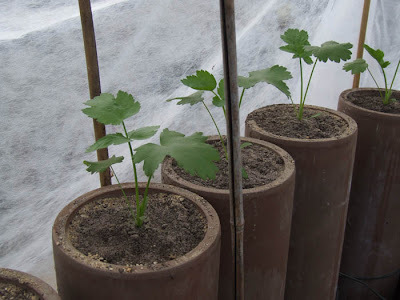 The 25 parsnips that are growing in the poly tunnel "Gladiator" are really starting to grow away now and you can see i had a sneaky peak at one to see the tops which are looking nice and clean. My tomatoes are just about ready for there final pots which will have the bottom cut off and two tomatoes will be grown in each grow bag inside the poly tunnel. I have to say these are the healthiest tomatoes Ive seen in a long time and I'm very impressed with this variety "cedrico" so far. Here you can see the leeks that have been planted out for about a week now and are coming along nicely. 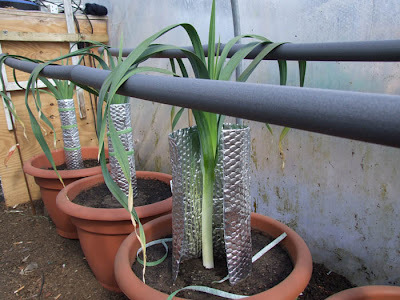 I have decided to test the "Pendle" leeks inside the poly tunnel this year using a new method by growing them in large pots with lots of holes in the bottom layed on a well manured ground with added fertilizers. Ive seen this method in action before and it seems to work well so i hope it works well for me. 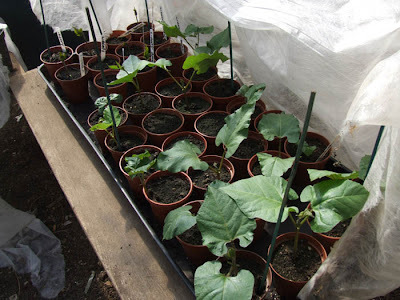 The "Welsh seedlings" have been planted outside in the raised and already require a higher support system which will have to wait until this weekend. 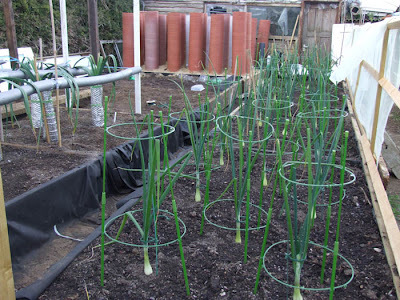 My onions have also been planted outside this year in the raised bed which are all supported with clips, canes, poles, anything you have handy to help A: keep the neck straight and B: To give the leaves some support to avoid them laying on the ground which can cause botrytis. You don't need to be to fussy about the leaves bending over as long as you avoid cracking the leaves this should not affect the onion, the supports are purely there for the above reasons. 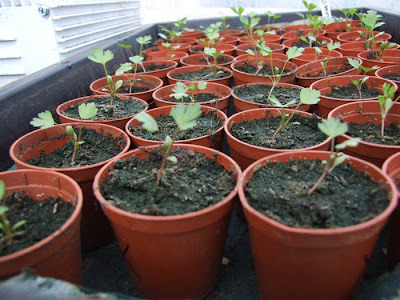 My 250g onions are also ready to be planted out, these are called centro which came as a free trail from medwyns so will be interesting to see how they get on. Most of my shallots at the weekend were thinned down and to be honest most didn't require it as they had only split into 3-4 bulbs anyway. The shallots are really benefiting from the calcified seaweed and seaweed meal that was incorporated into the lightly manured soil and seem to be growing away very fast. 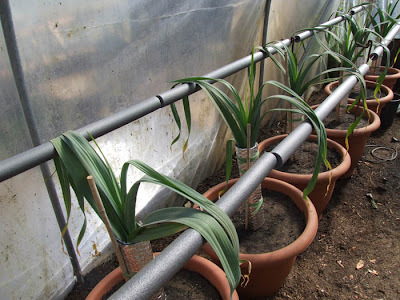 I normally thin the shallots to 4 bulbs per plant spaced evenly and gently tease the shallot bulbs away from each other over the next few months so they have room to grow without touching to avoid any flat sides. Some growers prefer to thin even more than this, but i find the bulbs go out of shape quicker and are less refined. I suggest a mixture of 2,3,4 bulbs per plant and see which suits your ground and your preference. Here we see the thinning's, don't let them go to waste (or let anyone eat them) if they have roots still left (even 1 strand) they will keep growing and produce some nice picking shallots. 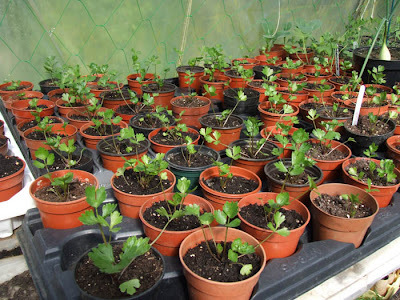 I tend to just shove all ours in a pot until they root and pot them off when i have time into 3inch pots which is where they will stay for the rest of the season. I already have 3 pots like this and some that are already in there 3inch pots. The tomatoes are looking great and coming along very nicely considering i only planted 10 seeds and all 10 germinated i couldn't be happier with them. I'm still not convinced on the methods of watering parsnips with so many people having so many different methods. Some growers water right up to June then start watering from the bottom, some only water at seedling stage and leave them alone, some just keep them evenly moist. I have to take into consideration that I'm growing them inside a tunnel that can reach well over 100 on hot days. This year i am going to try and keep them evenly moist and just limit the amount of water i give them until i feel they can be watered from the bottom. 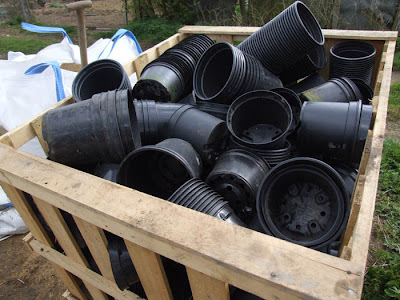 I also need to take into consideration that mine are in pipes rather than a large barrel that keeps more moisture in for longer periods of time. Being as this celery is the new f1 hybrids "Evening Star" and "Redstar" i have no idea if this is at the correct stage or not for this variety to be ready mid August-September as i have always grown "Ideal" which by now would be quite a bit bigger than this for the time of year. I have sown these variety's a good month later than i would Ideal as advised by many people so they should come good we hope. I know word verification is annoying when posting a comment, but i have now implemented this due to a gang of 12 year old girls who think we will actually click there stupid links. I hope this will stop the crappy spam I get on this blog. For those grown up people: Feel free to leave comments or questions. 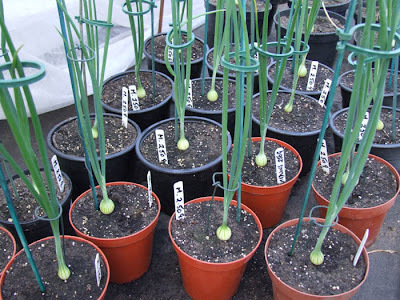 Here is a small video of my leeks so far that outlines the slight faults the pendle leek has. 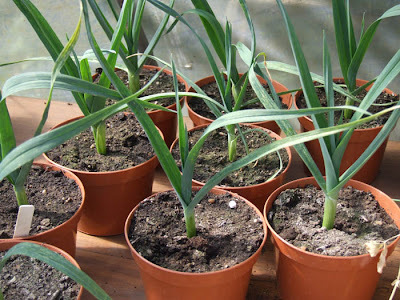 The first leek in the video is the welsh seedling and as you can see its a much finer leek and stays straight and true. The second leek is the pendle which really does wedge and i hope this isn't going to be a noticeable characteristic when matured. The pendle leeks also have a tendency to bend more and go out of shape but I'm sure once they get going they will be fine. I would say these leeks are on par for this time of the year and should be great specimens.